Often in the "Expat Adventure" column that I write for Swiss News, I talk about moments that could only happen when one lives or travels abroad. These are often moments when one feels stupid because of not understanding a part of the culture, language, or situation they find themselves in. Of course, these moments, while stressful at the time, are usually the ones I laugh about most after the fact, and to me, they are the reason living abroad will never get old. One of these moments happened to my husband and me last week in Sweden. After buying some items from the grocery store for a picnic, we made ourselves comfortable on a bench on the island of Djurgarden. A woman came and sat on the other side of the bench while my husband took out his beverage and took a gulp, only to practically scream bloody murder at what he had just drunk. "Try this," he urged me, as he coughed and choked his way back to recovery. 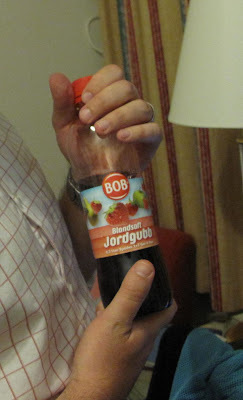 What had looked like an innocent fruit juice called "Bob" had actually been a syrup, and the amount my husband had digested in his big gulp probably had enough power to make at least a liter of strawberry juice. "That stuff will last him a long time." She was right. For the rest of the trip, Bob came with us so we could mix a little in our water at every opportunity. But Bob outlasted us and we had to dump him at the airport before leaving Stockholm. Because no matter how attached to his fruity flavor we'd become at that point, the airport security wouldn't let us take anything but the memory of him back home with us. hahaha, I can picture it in front of me when your husband is choosing Bob saft in the grocery aisle. "Hey, look at this Chantal....BOB!!! Let's buy it"
blandsaft... I'd have guessed it's juice too. Maybe the only hint for an innocent non swedish is the 7+1 at the bottom of the label.